Dr Harker is pleased to offer a superb treatment to tighten skin over the face, neck, jawline and around the eyes. As we get older the skin of the lower face and neckand around the eyes becomes looser. 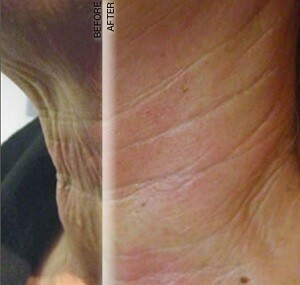 The soft tissues of the neck in particular are fragile and the skin thin and so this area gives away someone’s age. The more sun exposure to this area the worse the problem becomes. If there is too much loose skin, like a turkey’s neck you would need to see a plastic surgeon to have a surgical neck lift if you wanted to get rid of it. Catch it early if you want the no-surgery route. If yours is a mild case of turkey neck, the skin can be tightened with radio- frequency to get a good result, altering the crêpe like skin to a younger- appearing, firmer skin. The treatment can also used to firm up the jaw line and tighten the skin over the temples and around the eyes,where often the skin becomes loose and baggy. Each treatment lasts approximately 20- 30 minutes. A warm/hot sensation is felt on the skin which is not unpleasant but the radio- waves are focussed on the collagen below the surface. 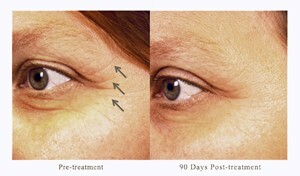 Over the subsequent weeks and months the collagen continues to tighten. The benefit may continue for 12-24months following the treatment, depending on the individual skin type and the care they take to protect themselves from the sun.